Harold Patrick "Pete" Reiser (March 17, 1919 – October 25, 1981), nicknamed "Pistol Pete", was an outfielder in Major League Baseball during the 1940s and early 1950s. He played primarily for the Brooklyn Dodgers, and later for the Boston Braves, Pittsburgh Pirates, and Cleveland Indians. 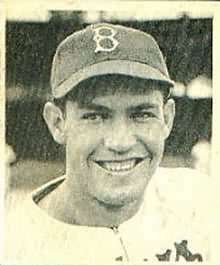 In 1941, his first season as a regular starter, Reiser helped the Dodgers take home the pennant. He was a sensation that year, winning the National League batting title while leading the league in doubles, triples, runs scored, and slugging percentage. He was also named a starter to the All-Star team and placed second in MVP balloting. On July 19 of the following year, Reiser crashed face-first into the outfield wall in St. Louis, trying to catch what turned out to be a game winning inside-the-park home run by Enos Slaughter of the rival Cardinals in the bottom of the 11th inning. The loss cut the Dodgers' lead over the Cardinals to six games. Despite missing just four games with the resulting concussion, he batted only .244 over his final 48 games that season, dropping his batting average from .350 to .310 on the season overall. The Dodgers ended up losing the pennant by two games to the Cardinals, who won 20 of their last 23 games and eventually the World Series. Reiser gave great effort on every play in the field, and was therefore very injury-prone. He fractured his skull running into an outfield wall on one occasion (but still made the throw back to the infield), was temporarily paralyzed on another, and was taken off the field on a stretcher a record 11 times. Leo Durocher, who was Reiser's first major league manager, reflected many years later that in terms of talent, skill, and potential, there was only one other player comparable to Reiser: Willie Mays. Durocher also said that "Pete had more power than Willie—left-handed and right-handed both. He had everything but luck." Reiser, a switch hitter who sometimes restricted himself to batting left-handed because of injury, served in the United States Army during World War II, playing baseball for Army teams. While serving, he was injured again and had to learn to throw with both arms. Durocher said, "And he could throw at least as good as Willie [Mays] right-handed and left-handed." When Reiser returned to the majors in 1946, he was still suffering from a shoulder injury from playing Army baseball. He later said: "It wasn't as serious as the head injuries but it did more to end my career. The shoulder kept popping out of place, more bone chips developed, and there was constant pain in the arm and shoulder." He was never the same hitter that he was early in his career. However, he still retained his speed and stole home plate a record seven times in 1946. Reiser managed in the minors for several years (including the Kokomo Dodgers in 1956–57, among others), winning the 1959 Minor League Manager of the Year Award from The Sporting News. He served as a coach on Walter Alston's Los Angeles Dodger staff from 1960 to 1964 (including the 1963 world championship team). However, he was forced to step down in 1965 as skipper of the AAA Spokane Indians as the result of a heart attack. His replacement was Duke Snider—the man who had once replaced Reiser as the center fielder for the Brooklyn Dodgers. When Leo Durocher was named manager of the Chicago Cubs in 1966, he brought many of his former players to coach on his staff. Reiser was one of them (1966–1969; 1972–1974). He also coached for the California Angels in 1970–71. In 1981, Lawrence Ritter and Donald Honig included him in their book "The 100 Greatest Baseball Players of All Time." They used what they called "Smoky Joe Wood Syndrome" to explain why a truly exceptional player whose career was curtailed by injury—despite not having had career statistics that would quantitatively rank him with the all-time greats—should nevertheless be included on their list. Reiser died in Palm Springs, California, of respiratory disease, at age 62, and was buried at Desert Memorial Park in Cathedral City, California. ↑ Golenbock, Peter. Bums: An Oral History of the Brooklyn Dodgers. ↑ "July 8, 1941 All-Star Game Play-By-Play and Box Score – Baseball-Reference.com". Baseball-Reference.com. Retrieved March 12, 2015. ↑ "1941 Awards Voting". Baseball-Reference.com. Retrieved March 12, 2015. ↑ "July 19, 1942 Brooklyn Dodgers at St. Louis Cardinals Play by Play and Box Score – Baseball-Reference.com". Baseball-Reference.com. Retrieved March 12, 2015. ↑ "Standings on Sunday, July 19, 1942 – Baseball-Reference.com". Baseball-Reference.com. Retrieved March 12, 2015. ↑ "Pete Reiser 1942 Batting Gamelogs – Baseball-Reference.com". Baseball-Reference.com. Retrieved March 12, 2015. ↑ "1942 St. Louis Cardinals". Baseball-Reference.com. Retrieved March 12, 2015. ↑ Durocher, Leo. Nice Guys Finish Last. ↑ Honig, Donald. Baseball When the Grass Was Real. ↑ Brooks, Patricia; Brooks, Jonathan (2006). "Chapter 8: East L.A. and the Desert". Laid to Rest in California: a guide to the cemeteries and grave sites of the rich and famous. Guilford, Connecticut: Globe Pequot Press. p. 238. ISBN 978-0762741014. OCLC 70284362.